Proctor Elementary School is dedicated to providing meaningful learning opportunities within a supportive, clean, and safe environment. We recognize mastery of academic skills as a primary goal. We strive to create and maintain an atmosphere that fosters the healthy emotional, intellectual, social, and physical growth of each student. We value education as a process of opening our students’ minds to critical thought and creative activity. We believe in the development of curriculum that encourages consideration for others, appreciation for diversity, compassion, empathy, responsibility, and self-discipline. We provide a curriculum that adapts to all learning styles and unique abilities. We incorporate the use of appropriate technologies to expand learning opportunities for students and increase their rate of success. We foster an understanding of traditions and contemporary issues. We emphasize that learning extends beyond the classroom walls and is a life-long experience. We promote a partnership between home, school, and community. We acknowledge that learning is enhanced in an environment of sharing, caring, laughing, questioning, risking, and growing. Our Vision Statement is a work in progress. You will receive an updated copy of the Vision Statement by the end of October. Everyone shares in the responsibility for student success. Each child is special and deserves our best effort to help them reach their full potential (academically, socially, emotionally, and physically). Personal growth is fostered through character building curriculum, conflict resolution practices, positive role modeling, and high expectations. Through data analysis, student progress and achievement are evaluated. Every parent/guardian in our school community is informed of our standards-based learning and assessment system, and the multiple measures plan determining promotion from one grade level to the next. A highly qualified teaching staff is dedicated to ensuring that each student find daily success towards meeting his or her goals. Students thinking and knowledge are extended through lessons differentiated in depth and complexity, and through independent, self-directed study requiring research skills and the construction of a final product. Proctor Elementary School models and exemplary learning environment that prepares every child for a successful future. Students are self-motivated and excited about learning because Proctor’s staff makes learning a priority each and every day. 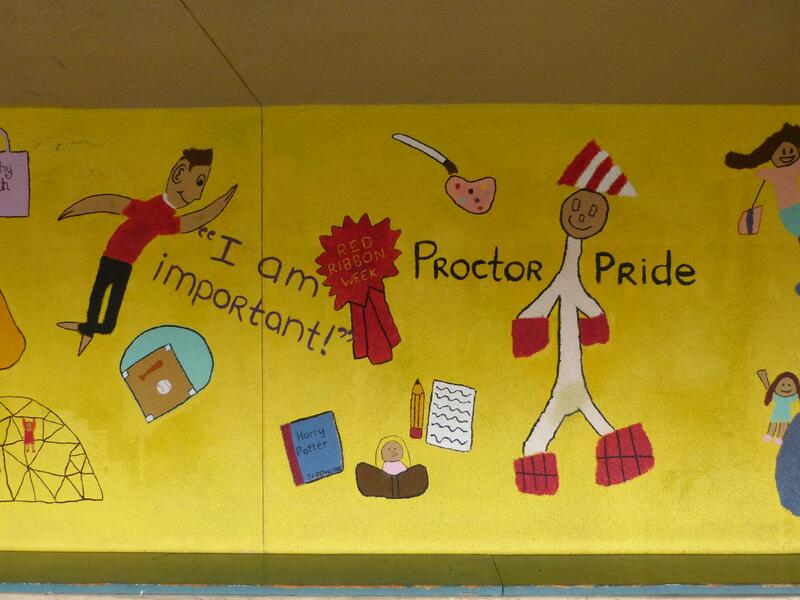 Proctor Elementary School supports student success through weekly and monthly awards programs. Everyone is treated with kindness and respect. A strong sense of community is evident as teachers, support staff, and parents collaborate daily. Clear, concise, and timely communication is used to maximize efficiency, including the use of technology. Extracurricular activities and materials stress inclusion and are reflective of the diversity within our world: gender, race, religion, culture, and exceptional needs. Well maintained campus is a collaborative effort between school staff, students, and the entire school community. Our highly qualified teaching staff is dedicated to ensuring that each student find daily success towards meeting his or her goals. Staff participates in regular professional development activities to continually update and refine their knowledge of current instructional strategies and practices.